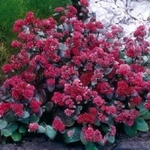 Sedum telephium 'Red Cauli' features thick grey-green foliage. As summer progresses the foliage takes on a purple hue and the clump is topped off by deep red flowers. Keep this perennial on the dry side and it will reward you with the easiest red flowers that you ever grew.